1. A hawker of quack medicines who attracts customers with stories, jokes, or tricks. A person who makes elaborate, fraudulent, and often voluble claims to skill or knowledge; a quack or fraud. OffMaps is a mapping application for the iPhone, that allows you to download map tiles to your iPhone for later viewing. Extremely useful if you are planning on travelling outside the U.S. Using packing fractions of course – the video explains it all and it is interesting way to learn about packing fractions. This is an extremely useful SQL Server 2005 script that will show you the amount of space used by individual tables in your database. The script uses the prebuilt stored proc sp_spaceused to determine space utilization. The problem is that sp_spaceused returns each table’s result as a separate query set. This script captures each result in to a temporary table and displays the results. How do you go about storing custom settings in a configuration file? If all you want to do is to store a name value pair, then use “<appSettings>” section. But what do you do if you wish to store more than one value per key. In this case you need to create a custom configuration section. Specifically you need to add a class that derives from “ConfigurationSection”, which will represent the “EFTConfiguration” section in the app.config file shown above. A class that derives from “ConfigurationElementCollection” which will represent the collection of “Settings” object in the above config file. A class that derives from “ConfigurationElement” which will represent each of the settings line that appears within the “Settings” element. Add the properly formatted configuration section (as shown above) to the config file. Add a reference to the class that implements “ConfigurationSection” to the app.config file. (In the <configuration><configSections> section). Step 1.3: Create a class that inherits from the ConfigurationElement class. This class stores the property values for each of the individual settings shown above. You will find that each property (Name, Value1, Value2, Value3) are implemented as properties. In addition the meta data defines whether the property is required or not and which one of the properties acts as the key (in this case it is Name). This class acts as a collection that will store all the settings objects defined as EFTSettingsElements. The main thing here is that GetElementKey has been overriden and we have added some indexer properties. Because the configuration section is called “EFTConfiguration” in my app.config, I am going to name the class “EFTConfigurationSection”. The name of the element that will contain the individual settings object is defined here – and in this case is called “Settings”. The above was all written within the namespace “EFTLibrary.Settings” (you will see why this is important in the final step. This section goes within the <configuration> elements of the config file. Step 3: Add a reference to the custom configuration class that tells .Net how to read the custom configuration section shown in step 2. In the config file’s configSection section (<configuration><configSections>) we need to add a reference to the cllas that derives the ConfigurationSection class. (In this case EFTConfigurationSection). For this you need the name of the module in which the class resides (could be exe or dll) as well as the class name and the namespace within which it is defined. name: the name of the section in the config file which stores custom settings using the custom provider being defined in the type property. And you should be in business! 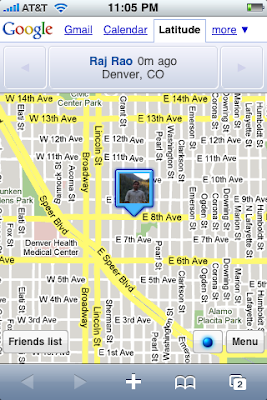 Google Latitude has been released for the iPhone as a web-app. Google Latitude allows you to share your location with people that you choose. Visit www.google.com/latitude on your phone to update your location. To access it as an application, click on the book mark button (+) and choose “Add to home screen”. It does not have a primary key! Spent many hours trying to figure this one out! OptiRoute has been updated with tweaks to the UI and the algorithm. I have also added a help document and screen casts on using OptiRoute.